At Cape Coral Home Builder, we produce attractively designed, quality constructed, well planned, and affordable custom homes that meet your expectations. Our designs are updated regularly to include the latest trends in design, and technology that will thrill you. Every detail of your quality custom home will reflect our years of experience and integrity. Your complete satisfaction is our top priority. Our goal is to exceed all your custom home expectations and make you a customer for life! Our custom homes feature unique architectural details with innovative designs, stunning architecture, and breath taking views. Your custom home will be distinctive and stand out as a premier property in the community. Effective job site management and project scheduling allow us to give you exceptional value. We use only the best subcontractors and building processes to provide you with your quality dream home. Our quality craftsmanship is guaranteed with a 1 year home warranty and scheduled follow up inspections to ensure your satisfaction. Review our floor plans. Read about our new home construction process, planning and development, general construction, and completion. Contact us to get started on your custom home with a waterfront view now! Homebuyers should expect more from a builder than just excellence in workmanship. The best materials and consistently superior personal service throughout the building process is an important part of the project. 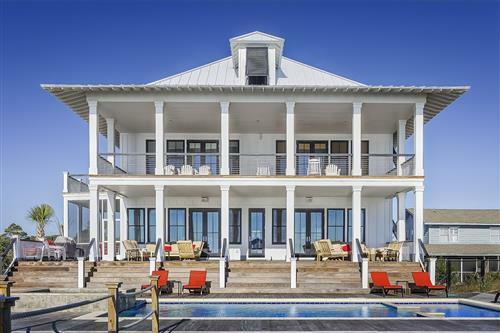 We have extensive experience in building custom waterfront homes, and apply those same skills, care and personal touch to every house we build, no matter where it is located.